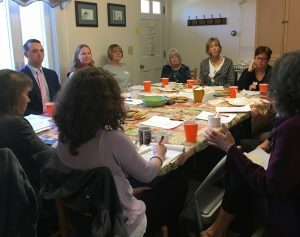 Choose To Be Healthy is a community health coalition serving southern York County, Maine. Coalition members and partners work to create a culture of healthy living by supporting policies and community changes that promote alcohol and drug free living for our youth. Funding comes through grants from the Maine CDC and the federal Drug Free Communities Program of the White House Office of National Drug Control Policy. CTBH staff, members and partners live and work in the towns of Berwick, Eliot, Kittery, Lebanon, North Berwick, Ogunquit, South Berwick, Wells, and York. We address the region’s most pressing health challenges, including youth substance use, through collaboration, community engagement, and evidence based strategies that help create healthy communities. Project Teams, led by coalition members with staff support these teams reflect on-going and as needed work plan efforts. Current teams include the Regional Law Enforcement Team and the Substance Abuse Action Team. Staff: Substance Use Prevention Director, Sally Manninen; Program Manager, Michelle Mason; and, Project Assistant, Kaytlin Kimball.